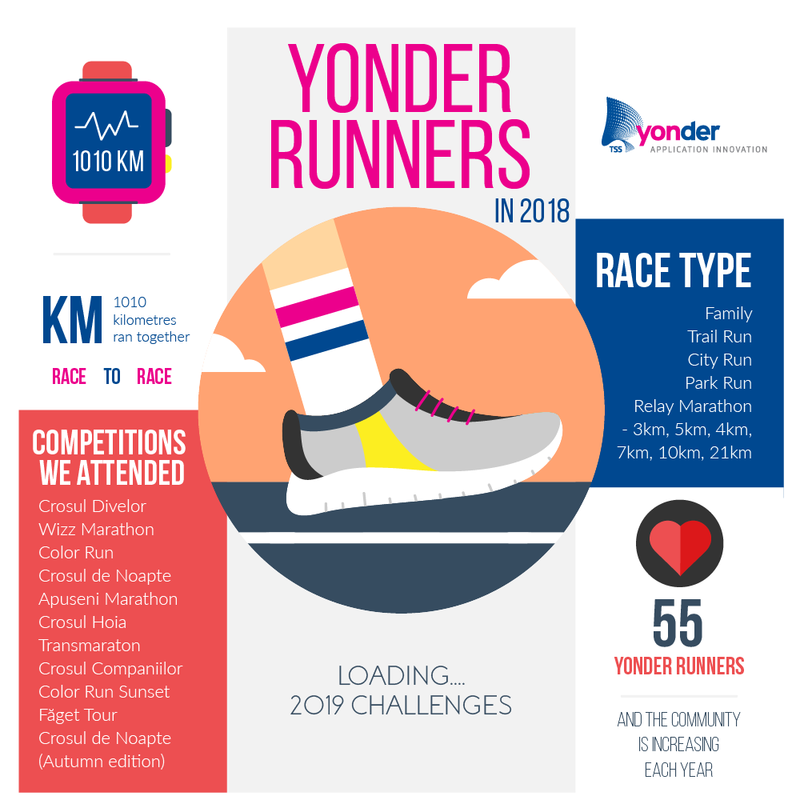 Spring is near and with it, our Yonder Runners community is preparing for a new series of events. Before we start, let’s reminisce about our achievements in 2018 with an infographic and a few testimonials from our colleagues. Andrei P. – How I started? For me, it all started as a challenge: the first competition I ever attended was WizzAir Marathon and it happened to be a team run. I was part of a team of 4 members which had to complete the 42 km marathon where each of us ran a 10.5 km turn. Before that, I had never ran for such a long distance and I had some doubts before the competition, but once the race started, I began to gain confidence with each step I made. I realized that while running, you get time to clear your mind and discover yourself. It’s a wonderful feeling and I encourage everyone to give themselves a chance to experience it. Cristina O. – How it all started for me? I never thought of myself as a runner and I’m not one yet, but last year I ran my first 5k. After that race I felt exhausted but amazingly happy and empowered. I participated in 4 running events in total last year and this year my personal goal is to exceed the previous performance, so, thank you Yonder Runners community! Simona F. – Running with my daughter is one of the most engaging and enjoyable activity that we do together. You never know how or when you are going to finish the race, but you know for sure that you are going to have a lot of fun running, walking or picking pine cones in a beautiful mountain race. Which was the most beautiful race this year? We really enjoyed the amazing sights seen in the mountain trails, but the most fun we had was running through the powder waves at Color Run. Lăcrămioara T. – Challenge yourself. I believe that growth doesn’t or rarely occurs when things are easy, but when we face challenges. Running gives you the opportunity to constantly challenge yourself. Either in distance or in time, endurance or speed, opportunities for improvement arise. And what is great is that in Cluj and also in Yonder you feel a community gathering around this activity. At competitions people cheer for one another, they want to see everyone around them succeed. And that’s the best feeling of all. Alexandra C. – Why do I run? I always had a fascination for people who run. I think it all started from the movies I watched when I was little – That feeling of fun and freedom people were experiencing while running. I think it’s the best way to interact and embrace our surroundings. For me, running is a competition with myself, it keeps my mind and body in perfect balance and furthermore is a gift I offer to my body and myself. What was the greatest challenge I experienced last year? Last year I challenged myself to participate in a half marathon. The competition is called Wild Race and I think it’s one of roughest and wildest competitions you can experience. You start by running and then you have some climbing and crawling through grottoes ahead. It’s a big challenge and I think that the feeling you get when you are there, within the mountains, breathing the fresh air, enjoying the spectacular view, overcoming your fears (for me it was being alone in the forest 🙂) it’s a feeling that you cannot describe with words. Call it freedom, happiness, but you always have to keep in mind, that running has to be done with a huge smile on your face. Be grateful for your progress, be grateful for each small step you take, thank your body and yourself for helping you finish each competition, but most importantly, don’t push yourself too much – you still need to enjoy the full experience. Marius I. – Running with my daughters: from “I don’t really want to go” to “Come on dad, run faster!” Sport is good for kids as it teaches them valuable things and it is also healthy. But I believe you should not just enroll them into skiing, skating or whatever other sport and then sit on the side nice and cozy. As a parent, I believe you should also participate, as it is a great opportunity for bonding, having fun, being a model and as they grow it will also be challenging for you to keep up. Of course, you have to do it in their rhythm, so they can enjoy it. Some great lessons from our community. Let’s learn together and set great goals also for 2019. Runners, dream big!